The Royal Ordnance L7 is the basic model of Britain's most successful tank gun. The L7 was a 105 mm L/52 rifled design by the Royal Ordnance Factories intended for use in armoured fighting vehicles, replacing the earlier 20 pounder (84 mm) found on the Centurion. The successful L7 gun armed many armored vehicles that include the British Centurion, and the German Leopard 1. The L7 was a popular weapon and continued in use even after it was superseded by the L11 series 120 mm rifled tank gun, for some Centurion tanks operating as Artillery Forward Observation and Armoured Vehicle, Royal Engineers (AVRE) vehicles. The L7, and adaptations of it, can be found today as standard or retrofitted equipment on a wide variety of tanks developed during the Cold War. L7 105 mm tank gun cut model on display at the Deutsches Panzermuseum. Work on what became the L7 began in the early 1950s under Armament Research and Development Establishment at Fort Halstead with the first gun trials in mid-1956. Later that year during the Hungarian Revolution of 1956, a Soviet T-54A medium tank was driven onto the grounds of the British embassy in Budapest by the Hungarians. After a brief examination of this tank's armour and 100 mm gun, British officials decided that the 20 pounder was apparently incapable of defeating it. Hence there was a need to adopt a 105 mm gun. The L7 was specifically designed to fit into the turret mountings of the 20 pounder. This would enable the Centurions to be upgunned with minimum modifications; hence, the fleet could be upgraded in a shorter time and at a lower cost. User trials of the weapon began in 1959. The first tank to be equipped with the L7 was a single uparmoured Centurion Mark 7 in 1959 which was to prove the viability of up-armouring and up-gunning the Centurion. From 1959 onwards existing Centurions were given upgrades with the L7 gun and armour and new builds incorporated the L7 at production. The gun was subsequently adopted by the German Leopard 1 (for which the L7A3 variant was developed) and the Japanese Type 74 (produced under licence by Japan Steel Works). 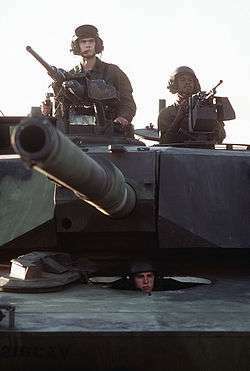 The U.S. M60 series and earliest versions of the M1 Abrams are armed with the M68 gun, which was designed to fire the same ammunition as the L7. The M68 is also featured on the early Israeli Merkava (also the M68). The Swedish Stridsvagn 103 turretless S-tank (armed with the Bofors L74 with an automatic loader) makes use of an indigenous gun design, which is compatible with rounds made for the L7. In addition, several countries have used the gun to improve the firepower of existing main battle tanks. Derivatives have even been mounted in Warsaw Pact-built T-54 and T-55 tanks in Israel, India, Egypt and Iraq, and Type 79 tanks in China. The breech uses a horizontally sliding breechblock for loading the fixed cartridge cases. 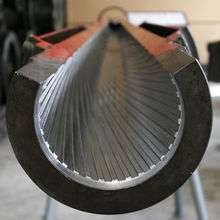 The gun recoils approximately 29 cm (11.5 inch) (in most applications), automatically opening the breech and ejecting the empty cartridge case as the gun returns to battery from full recoil. The barrel of the L7 is fitted with a bore evacuator approximately halfway down its length. The extractor is eccentrically mounted, which is a key recognition feature. Variant for the (West) German Leopard 1 MBT. The upper rear corner of the breech block reduced in size so gun can be depressed without hitting the turret roof. U.S. built gun for the M60 Patton. Initially designated as the T254E2, it is a variant of the indigenous U.S. 105mm T254. Unlike the 105mm T254, its tube was interchangeable with that of the British X15E8. It retains the round breech with a vertically-sliding breechblock of the T254 and initially used a concentric bore evacuator, which was later replaced with an eccentric bore evacuator. Also used on the M1 Abrams up until its replacement by the M256 on the M1A1. Used on Israeli tanks up until the Merkava III. Turkish licence built versions by MKEK under the designation of M68T for the 90mm armed M48 took place in the 1980s. The US M68 is also fitted to the M1128 Mobile Gun System (MGS) version of the Stryker 8x8 wheeled combat vehicle. Variant of the U.S. M68 designed for use on the Stryker MGS, fitted with an automatic loader. Republic of Korea Army's licence-produced variant of the American M68 gun. Used on, M48A5K and K1 tanks. Chinese copies of an L7 supplied by Austria. Argentine Army's licence produced by Fabricaciones Militares in Argentina. Used on the TAM medium tank. South African built variant for the Olifant Mk1A and Rooikat 105. Incorporates a heavily modified recoil assembly. ↑ Zaloga 2004, pp 13, 39. 1 2 Hunnicutt, R.P. (1984). Patton: A History of the American MBT. Presidio. p. 152. ↑ Hunnicutt, R.P. (1984). Patton: A History of the American MBT. Presidio. p. 154. Wikimedia Commons has media related to Royal Ordnance L7. Starry, Donn A., General. "Mounted Combat In Vietnam." Vietnam Studies. Department of the Army. First printing 1978. Hunnicutt, R. P. "Patton: A History of the American Main Battle Tank." 1984; Presidio Press. ISBN 0-89141-230-1.